Rolling eyes not directed at anyone in particular. Actually I too was wondering what gives a person removed from the forum the right to take up a new forum identity, and continue with the same behaviours? Lengthy and less than accurate post must be avoided. 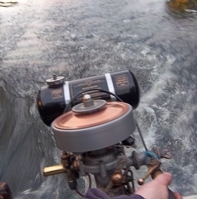 The crankcase stripping on my 102 engine was the first such event since I started restoring the Seagull engine. This engine had a seized top piston ring but the motor was in other respects in good condition, in some ways like new? Can someone please post a picture of the other options for Seagull cranks. Last edited by african imp on Wed Mar 06, 2019 7:39 am, edited 1 time in total. Another view of a 102 series crank. In my continued research.... I've noticed that there are crankcases with four bolts and others with five. The video on YouTube (link avail if reqd) of an Irish spoken guy re-assembling a bottom end shows a 40 crankcase with four bolts, pics (this thread, above) of African Imp's show five bolt fixings. Is this a difference confined to 64 and 102cc motors? Yes the 64cc Forty models have the 4 bolt crankcases, the Century, Silver Century and the model 102 all share the 5 bolt case, but most, certainlu=y all the early model 102 motors had a different tiller stud etc. Earlier Little Forty cases also had 4 bolts, but were different again. Which (4 bolt or 5 bolt) is most common, ie, available secondhand? And, is the 4 bolt (40 case) always with only two drilled holes for cylinder fixing? John is obviously the person to answer your question in detail, about whether all series 40s have a two bolt fixing. But, the simply answer is no. I know that the Early Series Forty ie the F,FV, FVP, LS and LM produced in 1949 to 1957, had four studs from the crankcase through the block to the head. This crankcases of this series of engines all had four bolts (actually studs) to hold them together and there were three different sizes of crankcases. The 5 bolt cases of the Century, Silver Century and model 102 and the 4 bolt cases of the Forty Minus (Featherweight) and Forty Plus are both readily available as used cases. The 4 bolt case of those models always has just two boles for the cylinder base bolts, of the smaller cylinder. Gannet and John - thank you.